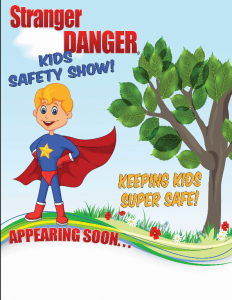 Presto Paul’s Stranger Danger Kids Safety Show is touring through your area and we would LOVE to present this program for your younger children! This is a UNIQUE EXPERIENCE that your students will LOVE and your parents will THANK YOU for hosting at your school! What To Do If They Get Lost! Kids see strangers every day in stores, in the park, and in their neighborhoods. Most of these strangers are nice, normal people, but a few may not be. Presto Paul will help protect your students from dangerous strangers by teaching them about strangers. Presto Paul is the ONLY Official Licensed entertainer in the Greater Cincinnati Area able to present The Stranger Danger Magic Show! This program teaches children about what a stranger is, what one LOOKS LIKE, who to tell when they need help. This show also educates children about “calling 911”. “Spot The Dog” the puppy puppet is a huge hit with young children and he also teaches the children what they should do if they GET LOST! This program is not just educational, but also very entertaining and geared specifically toward young children. The show consists of magic, audience participation and comedy. The children will laugh and learn! What If You Could Just Save The Life Of One Child In Your School? The “Stranger Danger” magic show will really help the children understand the dangers that strangers may present to them every day, as well as other safety concerns. Is this the complete answer? Of course not! I don’t claim to have all the magical answers. I do know that this educational program will certainly have an impact your children. Even if my Stranger Danger show saves the life of just one child, wouldn’t it be worth it? A Promotional Poster That Will Knock The Socks Off The Parents!